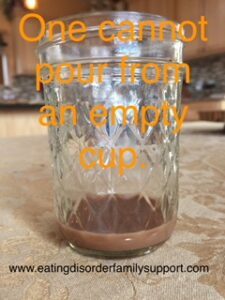 Caregivers cannot pour from an empty cup. Your loved one is in a crisis and needs a parent/family caregiver who is in top form and ready to provide loving support without erasing your own dear self. It may feel greedy and selfish to do things for yourself. I get that-it seemed that way to me when I was in your shoes. Now, I realize we cannot pour anything out of an empty cup. Once I embraced the concept that it could help my child’s recovery to have a parent who is not completely depleted but is in top form and ready to provide support, then I committed to daily self-care practices. It was hard to fit it in some days with all the work of caregiving, but I found some tools to help me remember to make it a priority. I’ll share some of what worked for me. Wrote a list of 10 things I love to do. And then…do at least one EVERY DAY. Yes, every day. This began to fill my cup back up so I could improve as a caregiver. It might seem such a small thing to do but it is essential. If you are burned out, you will be of no use to your loved one. They need you, and they need you to be strong. So, do the right thing and go fill yourself up! You are the one who is on the front lines; you’ll be getting the full brunt of the eating disorder’s wrath. You need extra defenses. so important I made it one of the topics of my new HUG Kits. Eating disorders can destroy relationships as well as lives. Doing your part to preserve your sanity and health helps you remain calm so you can actively preserve the relationship. That doesn’t mean it is going to be smooth sailing, but you can do your best to show the person in recovery that they are loved. Not an easy task with someone who often thinks they are unlovable and has their thoughts distorted by the eating disorder. When we can be calm, compassionate and confident in our decisions we can then cope with the wild things the eating disorder will throw at us in an emotionally objective way. Getting support is an essential piece of self-care. 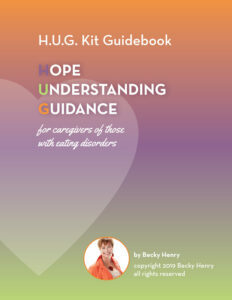 Loving and caring about someone who is in recovery from an eating disorder likely has left you feeling hopeless, helpless, overwhelmed, terrified, upset, confused and more. Choose your thoughts. When you start to worry say, “STOP!” and choose a different thought. Talk with the treatment team to clarify how you’ll work together as a team. Learn calming skills such as: DBT- Dialectical Behavior Therapy, Meditation, Breathing Skills. Get support, connect with others who’ve been on this journey. Make sure YOU also eat regular meals! Move your body in a joyful way each day. Just like they say on the airplane, you must put on your oxygen mask first! So, you out there-yes you, making sure someone else’s needs are being taken care of…it’s time. Get out the prettiest paper you have now (or any old thing) and make your list of 10 things you love to do, that fill you up. And then…do at least one EVERY DAY. Yes, every day. This will fill your cup back up and make you an even better caregiver or carer as our friends in the UK say. Getting support is an essential piece of self-care. Training on how to be an effective caregiver is available and research is now beginning to show how effective it can be in reducing caregiver anxiety, distress and burden. How might practicing self care help me be a more effective caregiver? How might doing my parallel process help us both? © 2018 | Becky Henry | All Rights Reserved.